This week at Randalls/Safeway they have a ton of great deals. The Buy 8 SAVE $4 MIX & MATCH Promo is back! Save $4 or more instantly when you purchase any 8 or more participating items in a single transaction with your Club Card. Look for items with these tags. Here are a few nice match-ups for the mix and match, go HERE to see a full list from Shellie! Randalls/Safeway Cereal Deal + Catalina! Thanks To Susan for the heads up… Right now they have post cereals on buy 4 get 4 and when you buy 5 or more. There is a limit of 20 boxes. When you buy 5 or more boxes you get a $4 catalina back. ** I think that Sunday was the last day for the catalina deal. I am checking on that now. But the 4 for 4 is going until Tuesday! 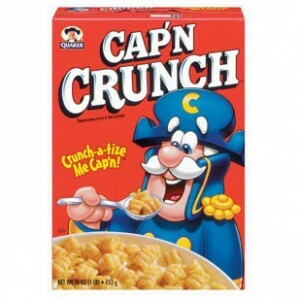 The Buy 4, Save $4 sale continues through Tues, 5/18, but this Sunday there will be a $0.50/1 Cap’n Crunch cereal in the Sunday coupon inserts AND a printable coupon on $0.50/1 – Cap’n Crunch available on redplum.com. Safeway/Randalls Scrubbing Bubbles Money Maker! The catalina for this deal ends on May 16th. But, the regular deal runs all week long. For us here in Houston this deal does not start until Wednesday when the sale changes at Randalls. It is such a great deal though you all should do it! Thanks Julia! Final Price: $4 Money Maker! Don’t forget to check the coupon database above for more coupons! 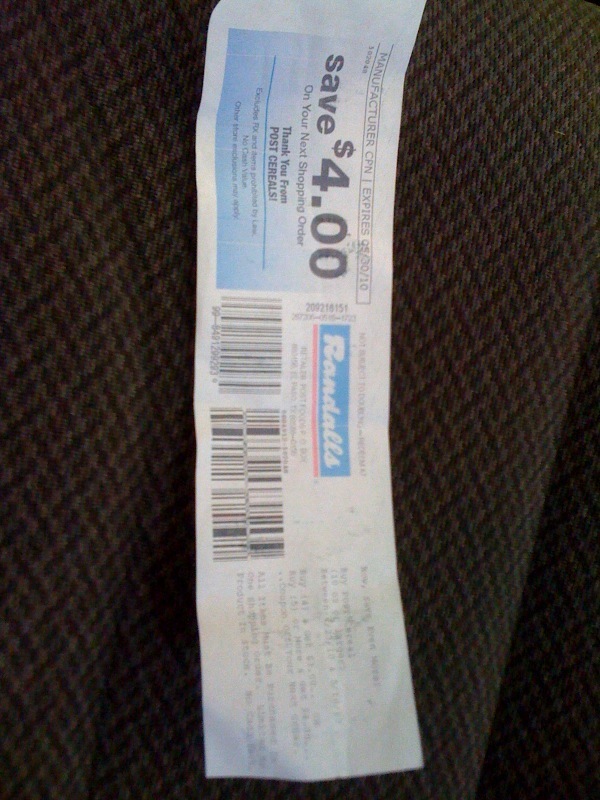 My Randalls doubles coupons up to $.50 and triples coupons up to $.35. They will only double or triple 1 of each coupon. $1/2 Printable (IE) or Printable (FF) Excludes 4-pk. Super Cheap Cereal! $.24 and $.33 a box! I have a cereal rule that it has to be under a $1 a box to even think about buying it! So here are a few ways to get some for only $.33 a box! Thanks to Krazy Coupon Lady for these great match-ups! Post Fruity Pebbles are super cheap this week (through 4/13) at Albertsons and Safeway/Randalls! Final Price: $0.96, or $0.24 each! Thanks To The Krazy Coupon Lady for this great deal! 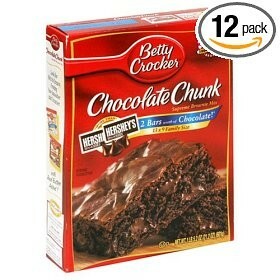 There are some good prices on Betty Crocker Baking products at Randalls/Safeway this week. The items below have multiple eCoupons available in addition to some printable coupons. I have shared before that in my opinion and after my research, it is okay to use an eCoupon with another paper manufacturer coupon. If you come to me to ask whether it’s okay to use the ‘$1.00 off Betty Crocker Cookie Mix AND Frosting’ in addition to another eCoupon for the Cookie Mix and/or Frosting, I’m gonna say probably not, it’s murky and your mileage may vary. All of the eCoupons would be deducted because there’s no system in place to stop that from happening. The scenario I shared below is my best estimate of what is an appropriate use of the coupons available. *I was able to load this coupon again today after having loaded it last week. Don’t forget when you are making your grocery list and heading out to check out the Coupon Database above for coupons! Anything you see in blue is a printable coupons, otherwise it will tell you where to find that coupon. The deals are alright this wee at Randalls, I think I will do better at Kroger…. Thanks to MDM for these match-ups! Buy 3 Save $3- Here are coupons to match up!!! $2/1 Coupons.com 10-ct. to 24-ct.
ONLY $0.75 WYB 4 or more- here are matching coupons! You are currently browsing the archives for the randalls category.